Castles with towers, moats and ramparts are notoriously the backdrop for great novels. The countryside of Padua is full of them….and they are in remarkably great shape. It doesn’t take much to feel like you have suddenly stepped back into the Middle Ages, with battle scenes and ladies in distress. 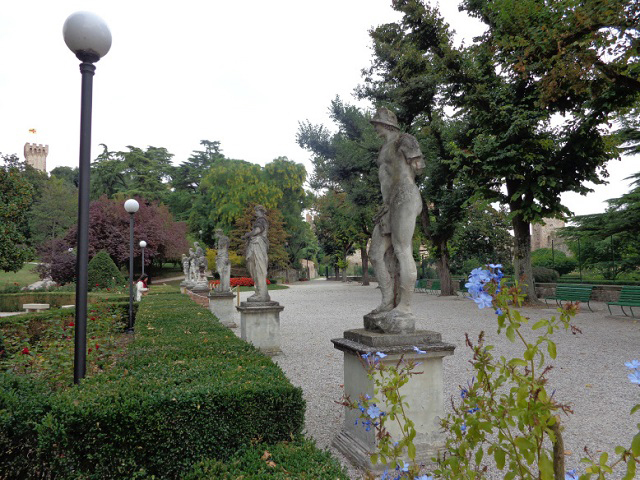 Padua, or Padova, is only 25 miles from Venice and nestled in the heart of the Veneto. A city rich in history and ornate basilicas, there is much to see and explore. One of my very favorite activities in the countryside is castle trekking. Here are a few that I found most captivating. Este, a village nestled at the foot of the Euganean hills, is just 30 kilometers south of Padua. All that is left of the ancient Carrara Castle are the fortified walls spaced by twelve towers that encircle the town. Built on the ruins of an earlier fortress in 1348 by Ubertino da Carrara, it was constructed on a square base. The Keep, a tower of refuge commanding views of the city, stands high on a hill in the center of the castle grounds flaunting a bright yellow flag. 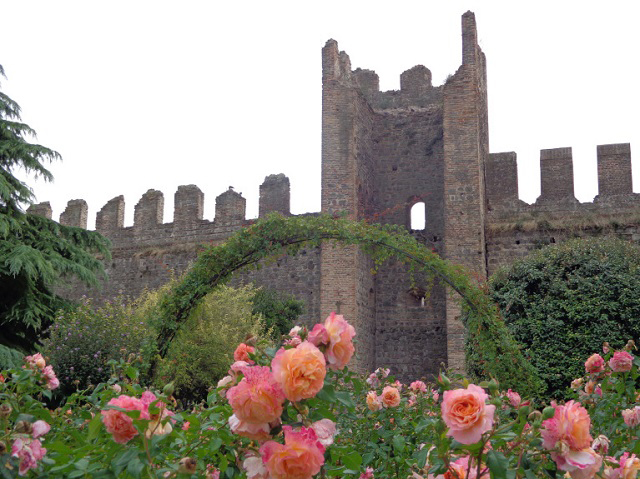 Today the castle grounds are bedecked with beautiful gardens of roses, trimmed shrubs, aromatic plants, lemon and olive trees. Large trees provide refreshing shade while murmuring fountains and mythical statues create an atmosphere of serenity. Here you can enjoy summer concerts among the charming scent of rose blossoms. The Museo Atestino is located near the castle and has a nice display of ancient Venetian culture as well as Roman, which illustrates the transformation of the city of Este. 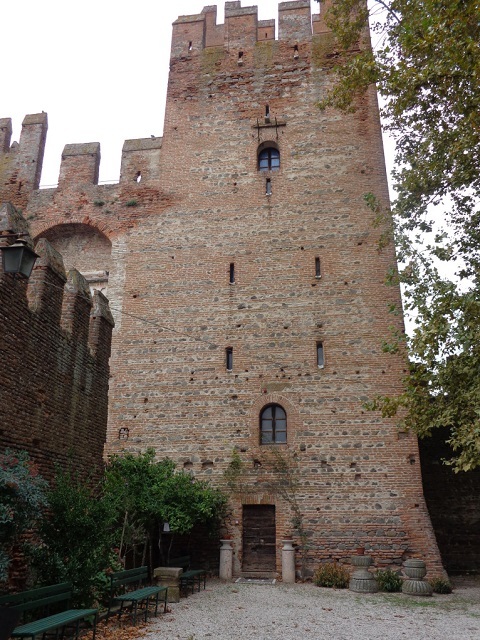 Montagnana, located about fifty kilometers from Padua, is surrounded by one of the best medieval walls in Europe. Estimated to be nearly two kilometers long, they remain perfectly intact today. Built in the 13th century on top of previous castle ruins, it is the oldest one in the area. Up until the 17th century the castle was completely surrounded by a moat and was accessible only by a series of drawbridges. Crenelated walls provide an entrance into the Castle. You can actually drive a car through the archway and proceed down the road. San Zeno Castle is now home to the Civic Museum “A Giacomelli,” with archaeological displays ranging from the neolithic period to Roman times. There is also a medieval and modern section to explore. 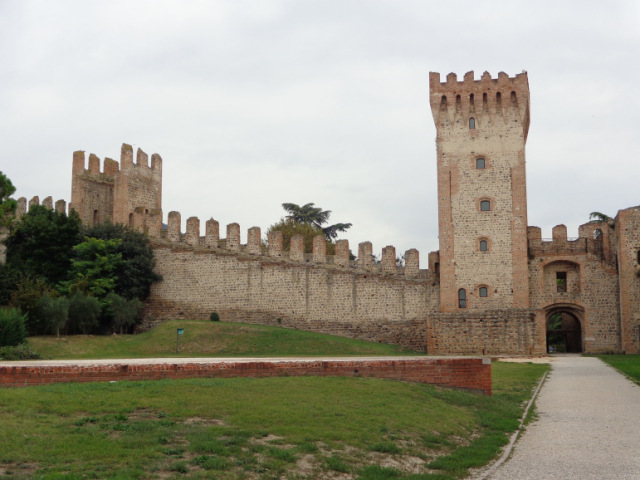 Whether you are looking for a day trip from Venice, or would like to explore the Veneto in more depth, I encourage you to take time and explore some of these quaint castle towns. You, too, may find yourself transported back to a time when knights reveled and troubadours sang on these fair castle grounds. Susan Nelson’s love for Italy began 12 years ago when she took a two week whirlwind tour of this lovely country. Since then she has been back several times only to fall more deeply in love with the culture, history, people and beauty of this country. She has written over 100 posts on her blog, Timeless Italy, and has done guest posts for Boomer Women Travelers among a few other online travel publications. You can most always find her in her home office researching and writing new articles that intrigue her about Italy. Follow Susan on Twitter. 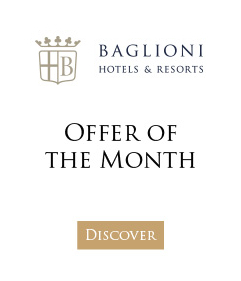 Concierge tip: Padova is ideally-situated for guests of Baglioni Hotel Luna in Venice where you can enjoy an unforgettably romantic stay with a host of special benefits as part of the Sweet Suite deal.